The word came first from Cynthia Ward: “Editor Warren Lapine is seeking *reprint* SF/F/speculative fiction (1,000-10,000 words) for a couple of new print/electronic anthologies. . . .” Then it continued in Warren’s words to the effect that he was starting a new webzine to be called FANTASTIC STORIES, but first would be “putting together a couple of anthologies in advance so there will be some product available when the first issue of the zine goes up. 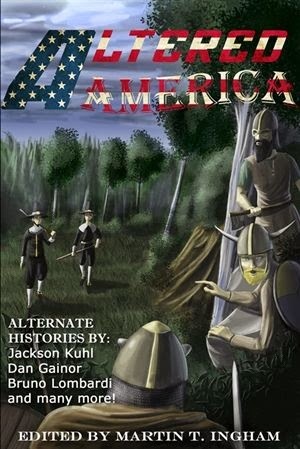 I’m looking to licensee reprint rights to stories for both a print and e-pub anthology. Each anthology will have about 800 pages of stories with a mix of classic and newer fiction. . . .” Warren and I go back a long ways, to when I had a story in the first issue of what became ABSOLUTE MAGNITUDE, back when it was titled HARSH MISTRESS SCIENCE FICTION ADVENTURES (funny story about that name, incidentally – remind me to tell it to you sometime), so of course I’d submit. In fact the story I sent went back to that time frame, first published in the Summer 1991 SCIENCE FICTION REVIEW and one of my first professional sales, called “No Place to Hide.” This was back when I was writing a lot of science fiction, though, presciently, with a bit of a nasty twist at the end (assuming, that is, that a tale about interstellar spaceship combat isn’t nasty enough in the first place). So then, in less than two weeks, Warren replied, “I like it. I’ll send a contract out next week.” And that is that. I don’t know the actual name of the anthology yet, but when I find out I’ll pass that on, as well as other information as it comes to me. But as perhaps a preview of what kind of story Warren has liked, I mentioned above that I’d sold one to him for HARSH MISTRESS, published, as it happens, in Spring-Summer 1993. This was a novelette called “Peds” which has since been reprinted by Untreed Reads as a stand-alone electronic chapbook. And for more information about that, one can click on its picture in the center column. Then speaking of pictures in the center column, if anyone has recently clicked the one for STRANGE MISTRESSES: TALES OF WONDER AND ROMANCE, the link to publisher Dark Regions Press has indicated that it’s sold out. In fact both it and its companion volume DARKER LOVES: TALES OF MYSTERY AND REGRET are officially out of print, at least for the moment (I have been in contact with Dark Regions but also am open to bringing them back under a different publisher’s imprint), and so I’ve changed the link for STRANGE MISTRESSES to take readers to its Amazon page where both used and new copies are available. In the case of DARKER LOVES, however, while it’s listed on Amazon too (and cheaper in some cases than from the publisher), some copies are still being sold by Dark Regions not only as a trade paperback, but also in a special, autographed, leather-bound and otherwise very nice collectors’ edition which, to my knowledge, is not available anywhere else. What a weekend! Along with wrestling with income tax (finished the federal forms Saturday p.m., state tax to go) I went to a “matinee” movie Saturday night, then today was actual matinee time for a Bloomington Writers Guild poetry reading. 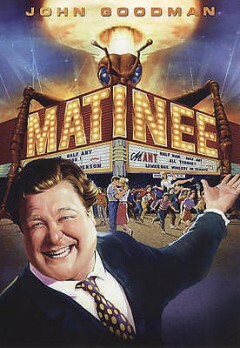 Matinee what? Well, Saturday’s movie was part of an “Art and Legacy of Roger Corman” program the Indiana University Cinema has been running this spring, this time celebrating the sf/horror exploitation films of the 60s with a special nod toward Corman rival William Castle in the form of schlock film priducer “Lawrence Woolsey.” The film itself is MATINEE, directed in real life by Joe Dante, and starring John Goodman and Cathy Moriarty as Ruth Corday, Woolsey’s long-suffering girlfriend, lead actress, and stand-in nurse (to have movie patrons sign wavers in case they die of fright during the performance). And then there’s 15-year-old monster fan Gene Loomis and his little brother, his new Ban-the-Bomb girlfriend, his friend Simon and his new girlfriend (and her little brother) with her juvenile delinquent ex-boyfriend (who also writes poetry) just back from reform school, all coming together in 1962 Key West Florida, site of the premiere of Woolsey’s latest movie, MANT! — Half Man, Half Ant, in Atomo-Vision with new RumbleRama. And, oh yes, by coincidence also occurring at this time is the Cuban Missile Crisis (with Gene’s father in the Navy and out with the fleet facing off with the Soviet Union). You really just have to see it for yourself. I recommend it! So today has been calmer, and also sunnier, good enough weather this afternoon to stroll downtown for this month’s Writers Guild “Last Sunday” poetry reading (see February 23, et al. ), starring Abegunde and previous Writers Guild chair and co-founder Patsy Rahn. And not only that (to quote this month’s announcement): “We are starting a new tradition at this event: we will have a table for LITERARY SWAP. Bring your literary magazines, journals, books that you’d like to pass on, and please take home any of your items not taken by others.” For myself, I only brought a couple of poems for the open mike session, both this time from VAMPS (A RETROSPECTIVE), “Leaves” (about a vampire competition runner) and “Night Child” (one who grew up as a vampire and “learned quickly”). Editor/Publisher Stan Swanson has announced a cut in the Kindle price for SLICES OF FLESH (Dark Moon Books, 2012), a Bram Stoker Award® finalist for superior achievement in an Anthology, to $2.9 9. 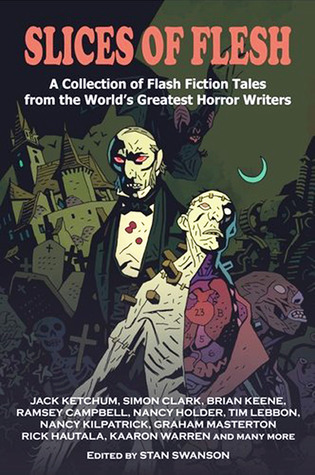 Billed as “a collection of flash fiction tales from the world’s greatest horror writers,” this big book (more than 325 pages in the print edition) presents readers with ninety stories by such authors as Jack Ketchum, Lawrence Santoro, Joe McKinney, David Niall Wilson, Nancy Holder, Ramsey Campbell, Marge Simon, William F. Nolan, Nancy Kilpatrick, “and dozens more” including . . . me. Moreover, profits made by SLICES OF FLESH are earmarked for charity, including literacy and reading programs, the HWA’s Hardship Fund, and the Stephen and Tabitha King Foundation. Available in print as well as Kindle, more information can be found here. My story in this one is “Bones, Bones, the Musical Fruit,” a brief tale of artisanship and necessity in the service of art originally published in BONE BALLET (Iguana Publications, 2005). “Bones, Bones, the Musical Fruit” is also reprinted in THE TEARS OF ISIS. Let us go back to February 17. That was when I announced that today’s interview, featuring . . . moi . . . with lore on writing as well as THE TEARS OF ISIS, would include “an all-new excerpt from one of the stories.” But which story? — ah, that’s where the mystery lay. Today, however, it has been answered in Sally Franklin Christie’s WRITERLY WEDNESDAY column. And not only that, find out my favorite word processing program (hint: it may not be the same as yours). Do I write alone or in the company of peers? What lurks beneath my bed? As for the mystery tale, though, in past interviews I’ve quoted from the collection’s title story, “The Tears of Isis.” But this one is different. In a comment on my February 17 post I did give one hint, suggesting it was a story that one of my reviewers on Amazon had specifically singled out. I can say now that other reviewers have mentioned it too, but, as for the answer. . . .
Well, the answer came a bit late today due to computer glitches at Sally’s end, but — better late than never! — to see all for yourself you may now press here. So, now that I’m signed up to go to Portland Oregon in May for World Horror Convention (cf. February 28), what did I do but buy a membership Sunday for the North American Science Fiction Convention in Detroit this July. NASFiC is the “local” equivalent of the World Science Fiction Convention — last gone to by me two years ago in Chicago (see September 3 2012, et al.) — held in addition to the regular WorldCon in years when it’s located overseas, as it will be this year about a month later in London England. A little bit far for me to travel (remember, I’m a writer, it’s not like I’m in a high-paying profession 😉 ). However Detroit is so close that the least expensive way for me to get there by air is by first flying to Atlanta Georgia (the site, I believe, for 2015’s World Horror Con, but that’s getting ahead of myself), then from Atlanta to Detroit. I am looking into alternate plans on this. Part of the reason of course is to flog THE TEARS OF ISIS, in this the year of its/my fame as a Stoker nominee and, along those lines, I have some hope of making it to World Fantasy Convention in Washington DC in November as well. That one, though, is in part contingent on friends tentatively planning to go there too, thus going by car and sharing hotel costs. But that is then and now is now — and, public relations aside, the important thing for me to remember (especially when figuring out logistics on that Detroit one) is that these conventions are also fun. “To celebrate National Poetry Month, the Horror Writers Association will be holding their inaugural HWA HORROR POETRY SHOWCASE in April 2014. Open to all poets, the SHOWCASE will be accepting submissions throughout the month of April with four poems chosen by HWA member judges to be honored on the HWA website. 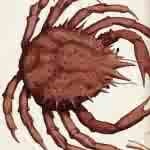 “We are looking for more than ‘blood, guts, worms,’ etc. Just being ‘icky’ isn’t enough. Poetry to fifty lines. Free verse preferred; no forced rhyme or cliches. Unpublished poems only (though previously published poets are, of course, welcome). “Submissions will be accepted via Submittable from April 1-30, 2014 and all rights will remain with the poets. In addition, at the judges’ discretion, an electronic chapbook of qualifying poems will be considered for publication under the aegis of HWA. Each poem chosen for publication will be paid $5. Then April is also the month of WRITERS DIGEST Poetry Editor Robert Brewer’s Poem-A-Day challenge (see November 1 2013, et al. ), in which he supplies poets with a daily prompt to use as a springboard, resulting (for those who take the bait) in thirty new poems at least drafted by May. In my experience, some of these will be crummy, some good, and a lot potentially good with a bit of judicial rewriting — but rewriting is part of the game anyway. Perhaps more to the point, a number of poems I’ve written for these challenges have ultimately resulted in sales. Brewer offers a similar daily challenge each November as well as, for the off-months, a weekly poetry prompt every Wednesday. For more information — or to try it out (it’s run as a part of Brewer’s regular blog, so more goodies may sometimes be found there too!) — poets may press here. Say what?!? Well, there was one question that went like this in my latest interview by British blogger Sonnet O’Dell: “Would you rather be trampled by one elephant sized mouse or one hundred mice sized elephants?” So take a moment. Think a little. Which would you rather? For me, the answer to that, plus some fifteen more questions (most more serious, some of them even — guess what? — about THE TEARS OF ISIS) is scheduled to appear on Sonnet’s DUSTY PAGES “Meet A Writer Monday” column on June 2. More will appear here when the date arrives. We may remember Sonnet O’Dell from last summer when I appeared in DUSTY PAGES the first time, even then plugging TEARS, of course, but back when Isis was still young and naive, virtually unreviewed. How far she’s come since! But that was then (cf. July 29, et al.) and now is now, with an (almost) all new set of questions and answers for this June’s first Monday. Only work that is clearly inspired by Edward Gorey — either through themes, tone, visual elements, or otherwise — will be considered for publication. So read the guidelines — and it sounded like fun. So off went five poems that seemed in the spirit to GOREYESQUE MAGAZINE, a more scholarlyish publication than I usually submit to — and wi th no pay either, which is often the way of scholarly journals. But, as I say, it sounded like fun! And now, a month and two days later, the email came back: two poems have been accepted, “New Arrival” about how to spot a neophyte vampiress and “The Short, Tragic Love of the Lobster and the Crab” about, well, the title sort of covers it. For more information on GOREYESQUE MAGAZINE press here. I, for one, am looking forward to seeing the issue!